When you have James Anderson working on your side, you have a skilled expert thats focused on providing you the neccessary services required by you. 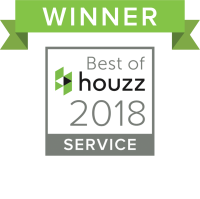 We are a complete Design/Build company that is fully licensed and insured. 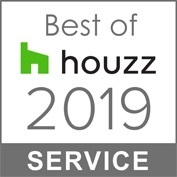 We pride ourselves on being a small family business with an impecable reputation for getting things done with complete 100% customer satisfaction. We can design a one of a kind backsplash and focal point for your new kitchen countertop. See our kitchen remodel page for more pictures and ideas. In this bathroom remodel the client requested an eclectic style design using non traditional materials. 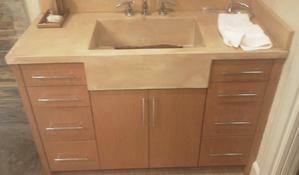 Our design encompassed a custom made Teak wood modern style vanity cabinet to accommodate an on-site hand made color impregnated concrete countertop with an integrated Farm style sink. 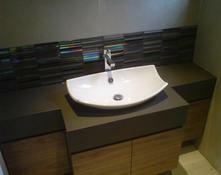 Corian countertops work extremely well in contemporary settings. With many uniform colors available to the flexibility of totally hidden seems. With solid surface countertops, the design styles and shapes are endless. The white Quartzite countertop in this kitchen remodel is a beautiful focal point. By differentiating the center island granite with Black Galaxy granite can also give the kitchen an interesting bold contrast. 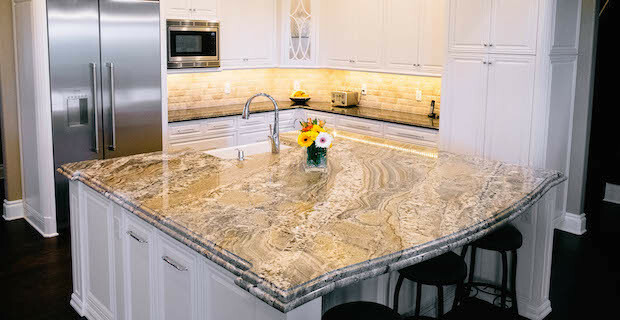 Vermont Mont Claire Marble countertop is durable to use in Kitchens & Bathrooms remodels. The timeless surface never goes out of style and is a beautiful finishing touch to any remodel. 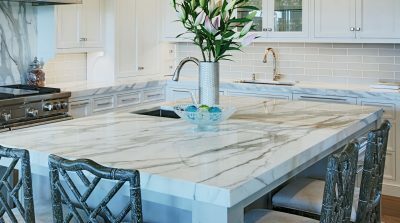 One of the most unique countertops available for any beach side home or condo remodel is Vetro Stone. 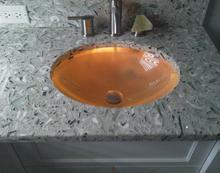 A countertop surface that is hand made using beach sand, shells, oysters, recycled beach glass and acrylics. The glass under mount sink is illuminated with LED tape light. 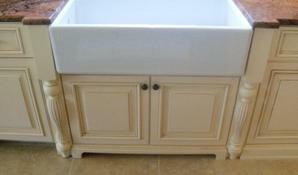 This Traditional Kitchen remodel in Longboat Key has an original "Rohls Farm sink" integrated into the custom cabinetry. The Diamond Red Granite enhances the classical French look.